Receive more info about booking "Wacky chad" for your event! Wacky Chad's award winning pogo stick skills, charmingly funny jokes and antics got him on America's Got Talent (Twice! ), and a performance at the Superbowl. For more than a decade, he has entertained thousands of crowds, from schools, fairs, festivals, theaters, colleges and universities all over the world. Prepare to be amazed, and if you don't like laughing, go somewhere else. Extraordinarily random. Super impressive. Hilariously funny. Laugh until it hurts as this stunt comedian rides another person on his tiny bicycle and handstands on a skateboard. 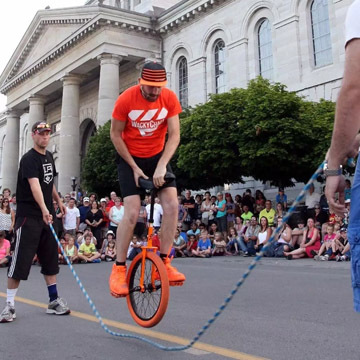 Wearing his trademark orange, Wacky Chad will reach neck-straining heights on his tall unicycle and defy gravity on a air powered pogo stick. Prepare to be wowed and if you don't like laughing, go somewhere else. Super charged and ready for action, Wacky Chad and his award winning pogo stick skills, charmingly funny jokes and antics got him on America's Got Talent, & Star King (Korea). He grew up in Syracuse, New York, but his "clowning around" started in Quito, Ecuador at age 19. And now for more than a decade, he has made thousands of people laugh at schools, fairs, festivals, theaters, colleges and universities all over the world. He has been voted as a fan favorite for his mix of hilarious stand up comedy, unusual tricks and stunts. BAM! 2. Introduction, Funny Dancing, Skateboard, Warm up Jokes and misc tricks. 3. Tricks/Jokes on Pogo Stick including backflip dismount. "Wacky Chad is amazing! We were thrilled to have him perform at our annual Fall Festival. He mesmerized the crowd with his stunts and people have already been asking if he will be back next year! Chad is a true professional and pleasure to work with, I would recommend him to anyone." "A top act! Definitely one of the crowd favorites! Really funny guy, and a fabulous act that the crowds loved and were bought to their feet!" "We had Wacky Chad at the Pasadena Strawberry Festival for the first time this year and he was a terrific draw. There were always huge crowds around his shows and we will absolutely ask him to return. The only problem I have is finding him a larger area for his performances due to the size of the crowds. He's a great guy, very professional and it was a pleasure to work with him." "Absolutely brilliant show at the Street Performance World Championship. By far the most entertaining and funniest act there, well done!" 'I've been in the entertainment field my entire life and I can honestly say that Chad is insane and is one of the top street performers that I have ever seen. He's a hard act to follow (and I know since I had to over and over again!)" “First let me say Tank you! I was in Boston last week with my family and we kept missing your show. We were Finally able to catch half of it and my daughters loved it so much we stayed around to see the whole thing the next time you did it. After that we looked at your website together and we would love to look into having you come to their school!. You are fabulous and we appreciated your show! Thanks for bringing a lil Joy to the Boston Marketplace!” “I took my son to see you today at Jefferson Community College in Watertown, NY. You were soooo very entertaining and we loved your show! I wanted to thank you especially for welcoming my overly-enthusiastic son onstage as he ran up there when you asked for a volunteer. My son has Down Syndrome. His name is Gunnar...yea, he was the heavy brick-of-a-kid that you lifted up on your shoulders and rode the tiny bike with. Thank you for just being yourself and treating him like any other kid. Made this mama super happy. We think you rock. Best of luck and many happy days as you continue your tour of travels. May you always touch peoples' souls with laughter and kindness.” !Sincerely, Lauri St Pierre Evans Mills, NY ! "It was really enjoyable. You not only made the kids laugh, but the adults laughed as well,"